For more than a decade, the Internet has influenced all the spheres of human activity, and music is no exception. There's been a complete flip in sales of physical vs. digital music, so buying a CD or a vinyl is a rare thing to do. Instead of going to a local record store we'd rather go to iTunes Store and purchase an album for $15 with a few clicks. On the other hand, there are free music sources like Youtube and SoundCloud which provide millions of songs free of charge. However, the quality of those tracks leaves much to be desired. A happy medium in this situation is music streaming that for a relatively small price offers quite a lot, and not only songs but podcasts, radio and video content, as well. The majors in this area are now Spotify, Apple Music, and Google Play Music. But, music streaming is a shaky area so we can't expect zero competition since young challengers are constantly encroaching the market and can easily surpass the leaders. Today, we are taking a look at Google Play Music vs. Spotify vs. VOX Cloud comparison. The latter is a newcomer, but it can quickly become a streaming boss. Anyway, they all have pros and cons, so let's start. Google Play Music is a great streaming service for devoted Google fans as it provides a music collection of 35 million songs, hundreds of playlists, podcasts, and video content. Once you subscribe, you also get a music cloud for up to 50, 000 of audio files (with strict restrictions to formats). Not that good if you prefer Hi-Res music. Once you buy Google Play Music, you get Youtube Red, which allows you to combine Youtube's music collection with streaming's library. That's an ultimate solution because there are no ads, but again, the quality is frustrating. Youtube Red - watch videos without ads and make a perfect playlist. Playlists - Google uses your search history to suggest you music for particular occasions. If there's a music video for a song you're listening to, you can switch to the video on Youtube, and it will continue playing where you left off. Music cloud for 50,000 songs. The music cloud converts whatever you upload to MP3. No chance to enjoy Hi-Res music. It's not available in all countries. Google Play Music doesn't have a separate desktop app. It often suggests music you Googled, but aren't likely to enjoy. No rating system, only thumbs up and down. Low-quality streaming at 256-320 kbps in MP3. Spotify Premium also has quite a lot to offer. Its music collection numbers 30 million songs, thousand of playlists of all kinds, podcasts, videos, and radios. It also operates and a social network, where you can follow friends, share separate songs and playlists and recommend music. Premium subscription includes Spotify Connect which lets you listen to Spotify music with different devices including Sonos, Amazon Echo, PS3 and much more. As well as Google Play Music, Spotify emphasizes quantity rather than the quality. It streams at 256 kbps Ogg Vorbis. There's also so-called Spotify Hi-Res, but actually, it's not pure Hi-Res. Playlists is a separate thing to discuss since there are "The Very Best of [artist's name]," mood playlists, genre and era playlists. Some of them seem pretty amateur since you can as well find Drake's last album in "90s' Hip-Hop collection". There's a free version that gives the same features excluding Spotify Connect and adds very annoying and obtrusive ads that forcefully encourage you to buy Premium subscription. Spotify has a free desktop option. Appealing design makes it easy to navigate in the app. A big number of playlists. Spotify web player for browsers. Spotify Connect for HiFi systems. Spotify is available in only some European countries, Australia, New Zealand, and the Americas. Poor quality sound (256 Ogg Vorbis). Annoying ads in free tier. You can't move songs in your personal playlist. They appear on the list as you add them. VOX Cloud (formerly LOOP Unlimited Music Cloud Storage) is a music cloud that stores all your music regardless of the format or size. It's used together with VOX Music Player for Mac & iPhone. Although here I'm talking about music streaming services VOX Cloud can also be called so since you first upload and then listen to what you have there. VOX Cloud is a part of VOX Premium. Why is VOX Cloud different from other music storages? VOX Cloud is an Unlimited music cloud. You can have there absolutely everything you want, a million, ten million or even a hundred million songs. Simple rules – the more, the better. VOX Cloud has no restrictions to formats of audio files. It's the best way to listen to Hi-Res music as you can upload FLAC, ALAC, WAV, AIFF, PCM, etc. without conversion or compression. You upload FLAC 4096 kbps/96kHZ – you listen to this exact quality. 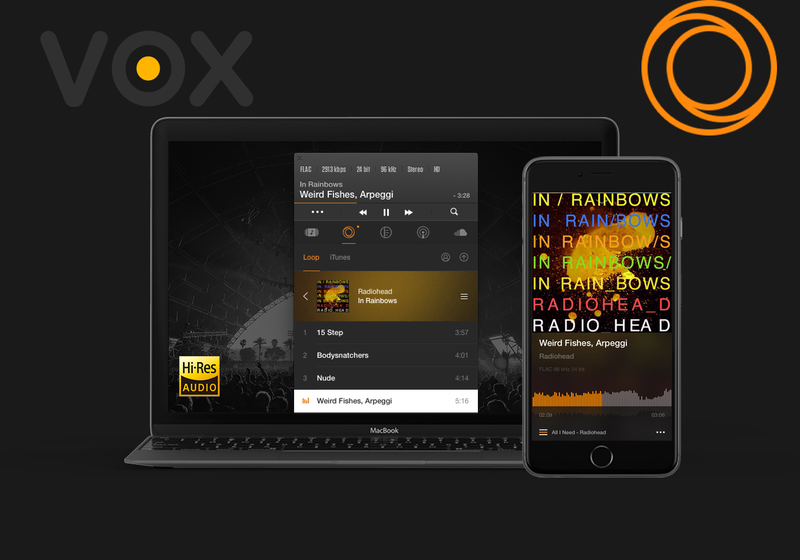 You download VOX Music Player for Mac & iPhone, sign up for VOX Premium account and then upload your entire collection to the cloud. Then you've done that, you can listen to all your music, anytime, anywhere. Moreover, if you're not good at creating playlists, you can connect to your Spotify and SoundCloud accounts to combine all three sources into one app. Unlimited space for your music – upload as much as you want. No restrictions to music formats – FLAC, ALAC, WAV, AIFF, PCM, CUE and others. You can sync your iPhone and Mac to listen to Hi-Res music on iOS devices. SoundCloud, Spotify, and Last.fm integration. Download songs and albums for offline playback. EQ and BS2B technology for enhanced sound. You have to upload tracks by yourself. Concerning the last point, I should say that it does require some efforts, but the upload is fast. I managed to upload 3 GB of Hi-Res music in 5 mins. Although there's no apparent winner, I prefer VOX . The reason is that I value the quality of sound, and when I've uploaded 150 Hi-Res albums and connected my Spotify account to discover new music, VOX Premium appeared to be a perfect tool for high-quality playback combined with huge Spotify collection.